DALIAN, June 28. /TASS/. 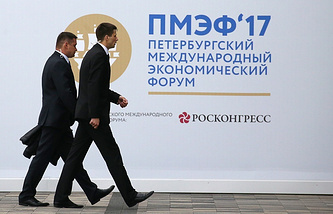 The Russian Ministry of Economic Development plans to start free trade zone (FTZ) negotiations with India and Egypt and make a temporary pilot agreement with Iran, Deputy Minister Alexei Gruzdev told reporters on Wednesday. "Regarding India and Egypt, I think we will start talks this year, probably closer to the year-end. Negotiations with Israel have already started. Therefore, our agenda is fairly packed for near time," the official said. Negotiations can normally last two-three years, Gruzdev said. "We are certainly not in the mood to protract this process but at the same time we cannot forecast how much time will it take," he added. Negotiations are also underway now between the Eurasian Economic Union (EAEU) and Iran on a pilot preferential agreement. "Indeed these are not classic talks on the free trade zone because Iran is not a member of the World Trade Organization. Development of a preferential agreement leading to establishment of the free trade zone was the case in point from the very start," Gruzdev said. The countries are currently negotiating the list of goods items to have special trade conditions. "There is unity from standpoint of the Union [EAEU - TASS]; no final list because the list is the subject matter of talks," the official said. The list will contain 200-300 positions addressing interests of Iran and the EAEU at the initial phase. Iran is mainly interested in agriculture and certain positions in mechanical engineering, Gruzdev said. "The interest of the Union is certainly much broader, considering the differentiation of our economy; therefore talks continue," he said. The pilot agreement with Iran may be signed already this year, Gruzdev added.